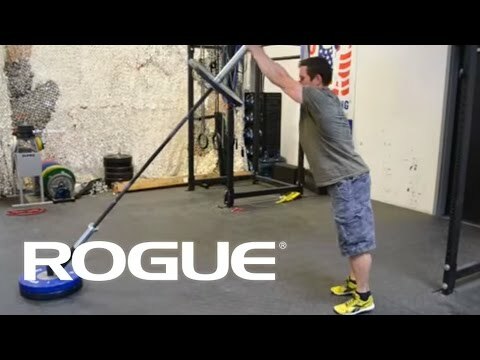 Rogue’s Post Landmine offers a simple, portable solution for increasing an athlete’s overall explosiveness and range-of-motion. Equally suited for garage gyms and professional training centers, this freestanding version of our standard Rogue Landmine requires only a pair of stacked bumpers or 45LB metal plates for mounting-- meaning you won’t need an existing rig, rack, or squat stand to start an angled barbell training regimen. Built in Columbus, OH, the Post Landmine features a 7-gauge steel, 10" bar insert sleeve that will fit the majority of standard Olympic barbells. This sleeve is designed to pivot 360 degrees in a fluid motion, which is essential for rotational training exercises like the landmine press, landmine row, or standing barbell Russian twist. Post Landmine is rated 4.9 out of 5 by 35. Rated 5 out of 5 by jkitch05 from Great piece of equipment If you think that you can just wedge your barbell in the corner and replicate what this does you are wrong...I speak from experience. The Post Landmine is such a small piece of equipment that allows you to do a ton of different things. It is an efficient worthwhile the investment. Rated 5 out of 5 by Chris D from Post Landmine Love it, works great! Heavy duty and well made which is exactly what I expected from Rogue! Rated 5 out of 5 by Shooter45 from update to previous review, does what it’s supposed I modified this mount to mount in the rack since for my need the post is to tall. Rated 5 out of 5 by Coach Wells from Perfect addition to my garage gym The post landmine was the perfect additional to my garage gym. Using the post landmine added so many more exercises that continue to help me build strength and stamina as I turn 60 this year. Rated 5 out of 5 by mllath from Perfect! Best piece of add-on equipment ever! Easy to use! Have had for over one month and the difference in my oblique muscles is amazing!!!! Thanks Rogue!! !